A recent study investigated if taking MCT or CLA as supplements helped decrease your appetite. Along the road to sustainable weight loss, the best of dietary intentions are often derailed by the reality of seemingly insurmountable, gut-wrenching hunger. While certain dietary modifications can potentially increase satiety, such as increasing protein intake, other methods of reducing hunger are continuously being sought out. Some research suggests swapping some vegetable oil for either natural trans-fat or coconut oil might help tame your growling stomach and aid in your weight-loss goals. There’s a chance this might be true. Not all trans-fat are irrefutably unhealthy. The synthetically-made trans-fat found in fast-food french fries are known to be deleterious to health and have been banned from the U.S. food supply by the Food and Drug Administration (FDA). On the other hand, research on the health effects of conjugated linoleic acid (CLA), which is produced naturally in the digestive tract of ruminants like cattle, goat and buffalo (but also made synthetically), is still conflicting. There are 28 different forms of CLA, which as shown in Figure 1, all differ structurally from linoleic acid only in the position of their double bonds. The cis-9, trans-11 (9-CLA) and trans-10, cis-12 (10-CLA) variations are the most abundant and have recently garnered some attention for several potential health benefits, including the ability to increase satiety and reduce body fat (primarily 10-CLA). Similarly, the predominant saturated fats in coconut oil, known as medium-chain triglycerides (MCT), have also shown promise in reducing hunger and body fat. Some research has also found an association between MCT consumption and a reduction in food intake, whereas no human research has been conducted analyzing the effect of CLA on food intake within the same day. Therefore, the purpose of the current study was to add to the recently growing scientific literature on the possible health benefits of CLA and MCT, by comparing the effects of CLA and MCT consumption at breakfast on satiety and food intake. Some recent research seems to support the roles of MCT and CLA in promoting satiety, reducing food intake, and supporting weight loss. Adding to the growing literature, the purpose of this study was to compare the effects of MCT and CLA consumption at breakfast on satiety and food intake. Nineteen healthy adults that didn’t consciously restrain food intake, were not highly physically active (less than 10 hours of vigorous exercise a week), habitually ate breakfast and lunch, and were not on prescription medications participated in this randomized, single-blind study. Each participant was tested under three different conditions on three different days. A day before the first test day, participants were asked to fast for 12 hours, refrain from strenuous physical activity, restrict alcohol and caffeine intake, and record their food intake for the day. Upon arrival to the laboratory, participants were randomized into three groups, each required to consume a 250 milliliter Tesco red berries smoothie (123 calories, 0.8 grams of protein, 29.8 grams of carbohydrate) along with either five grams of CLA and 16 grams of vegetable oil, 25 grams of MCT, or 22 grams of vegetable oil. All three smoothies had the same amount of calories and fat. Both before and thirty minutes after the participants finished their breakfast, they were asked to complete a visual analogue scale (VAS) survey, which contained several questions pertaining to hunger and satiety in order to assess subjective satiety. The survey was completed every half hour until the participants felt hungry enough to ask for lunch, at which point that specific participant was served and the amount of time between breakfast and the lunch request was recorded. The lunch was ad libitum, meaning that the participants could eat as much food as they wanted. Each participant received six sandwiches paired onto three plates and were allotted 30 minutes to eat with no distractions. Food intake, which was the primary outcome of this trial, was measured at lunch, by weighing the plates of food before and after lunch, and for the rest of the day, by requiring that participants keep a food log. The same procedures of the first test day were repeated on two other non-consecutive test days. The only difference was that each participant switched to a different group so that they could consume a different type of fat with their breakfast. Nineteen healthy adults consumed a breakfast that varied in fat content, containing either CLA and vegetable oil, MCT, or vegetable oil. Participants were then served a buffet-style lunch on-request. The primary outcome was energy intake, which was recorded at lunch and for the rest of the day. Subjective satiety and time between breakfast and lunch request were also recorded as secondary measures. No statistically significant difference in lunch intake was seen between all groups. The food intake for the rest of the day, however, was significantly lower for the CLA (471 calories) and MCT (525 calories) groups compared to the vegetable oil group. The total food intake for the day was also significantly lower for the CLA (541 calories) and MCT (594 calories) groups when compared to the vegetable oil group. The time between breakfast and the lunch request was, on average, shortest for the vegetable oil group (142 minutes) and longest for the CLA group (182 minutes). 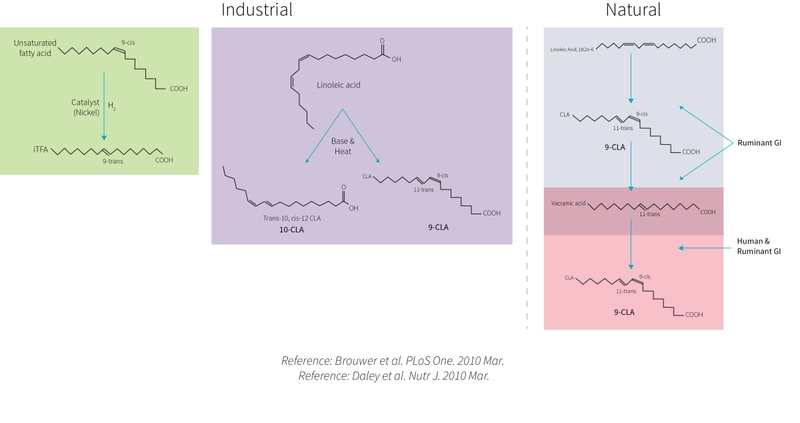 While the MCT group also had a greater delay between breakfast and lunch compared to the vegetable oil group (25 minutes), only the difference between the CLA and vegetable oil group (40 minutes) reached significance. Based on the VAS, there was no significant difference in subjective satiety between breakfast and lunch. Compared to the vegetable oil breakfast, the MCT and CLA breakfast led to a greater average time until lunch was requested, although only the difference between the CLA and vegetable oil group reached significance. The MCT and CLA breakfast also led to fewer calories consumed later in the day when compared to the vegetable oil breakfast, which in turn led to fewer calories consumed throughout the entire day. Subjective satiety did not significantly differ between groups. The results of this study seem to suggest that substituting MCT or CLA for vegetable oil at breakfast can substantially reduce food intake (by at least 500 calories) for the rest of the day. Not only is this statistically significant, but it’s also clinically relevant, as 500 calories per day can add up over time into pounds lost. However, since this study only measured acute effects, long-term trials are needed before researchers can determine if this simple swap at breakfast is effective for weight loss. That said, even as acute effects, these results seem a little too good to be true and warrant a closer look at why this substantial difference in caloric intake may have occurred. The authors seem to imply that the delay in eating lunch could lead to less food intake in the evening. But the timing factor may not explain the whole story, as the MCT group ate lunch only 25 minutes later than the vegetable oil group, while the CLA group took an extra 40 minutes. Another possible explanation is that participants ate less food later in day due to gastrointestinal issues. Gastrointestinal side effects from consuming MCTs have previously been reported. In this trial specifically, five participants reported such side effects for MCT and one for CLA. It could also be argued that food logs are not a reliable measure of food intake, as people can purposefully or accidentally underestimate their food intake. However, while this is possible, it doesn’t seem prudent to chalk up over 500 calories in difference solely to self-reporting bias, especially since they were required to weigh the food they logged, and they didn’t know which supplement they were taking. Nonetheless, the results of this trial still suggest that replacing vegetable oil with MCT or CLA at breakfast can lead to a significant reduction in the amount of calories eaten throughout the day, regardless of the reason behind it. Still, the study design has several limitations. Even though the drinks with various oils were pretested on another group of people to make sure the taste of each breakfast did not substantially differ, it is still possible that the participants were able to discern which oil was in their smoothie, which could then influence the way they ate later in the day. Finally, the sample size (n=19) was relatively small, as is typical for acute-effect feeding trials. Replacing vegetable oil with MCT or CLA at breakfast could potentially lead to a reduction of food intake later in the day equivalent to approximately 500 calories. Although the authors seem to attribute this to increased satiety, there may be other factors in play. Overall, further research is necessary in order to confirm these findings and determine if this could amount to sustainable weight loss. This is the first study to find that consuming CLA instead of vegetable oil at breakfast could delay and reduce food intake for the day. A previous trial found that supplementing either 1.8 grams or 3.6 grams of CLA per day did not affect food intake at breakfast compared to an oleic acid placebo, but it did lead to significantly decreased feelings of hunger and increased feelings of fullness and satiety. Another study found that supplementing 3.9 grams of of CLA per day for 12 weeks did not significantly reduce subjective satiety ratings when compared to a high-oleic acid sunflower oil control, and, while the study didn’t measure food intake, they also found no significant difference in body composition between both groups. Keep in mind however that neither of the previous trials specifically measured how a single-dose of CLA eaten at breakfast affected meal request timing and food intake for the rest of the day, making it difficult to compare the findings of the trials. 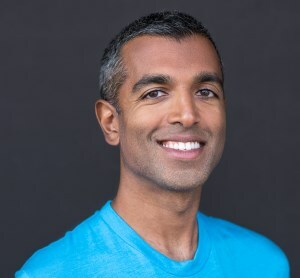 That said, considering that the research analyzing the effect of CLA on satiety and food intake is limited, and also that a recent review found that the studies examining the effect of CLA on body composition are equivocal, further studies are required to form a solid conclusion on its effectiveness in regard to satiety, food intake, and weight loss. A few studies examining the effects of MCTs on satiety and food intake have been conducted. One previous trial found that MCT consumption at lunch led to reduced food intake at dinner. Similarly, two other previous studies reported a decreased food intake at lunch after a breakfast rich in MCT. Overall, the research examining the effect of MCT on food intake actually seems to be more congruous than for CLA. Furthermore, a recent meta-analysis found that replacing long chain triglycerides (LCTs) for MCTs may lead to modest reductions in body weight over time. Nonetheless, more research is still necessary in order to confirm these findings. While the mechanism behind MCT’s potential ability to increase satiety and reduce food intake isn’t fully understood, many have attributed these effects to the unique manner in which MCTs are digested, absorbed, and utilized, which is detailed in the accompanying sidebar. Likewise, CLA’s mechanism of action is far from being fully understood. Preliminary research suggests that CLA may reduce the synthesis and increase the breakdown of fat, while also increasing the use of fat as fuel for muscle. However, very few mechanisms explaining CLA’s potential ability to increase satiety and reduce food intake have been proposed. The most common one is that by increasing the availability of fatty acids for muscles to use as fuel, CLA has a glycogen-sparing effect, which has been proposed to serve as a satiety signal. However, this has yet to be confirmed. Since this is the first study to find that consuming CLA instead of vegetable oil at breakfast could delay and reduce food intake for the day, and findings from previous trials analyzing CLA and weight loss are incongruous, further trials are necessary to confirm these findings. Conversely, the finding that isocaloric exchange of LCT for MCT can lead to modest weight loss is on more solid ground, since it is in line with previous studies. How does the digestion of MCTs and LCTs differ? A triglyceride is chemically composed of a glycerol backbone attached via an ester bond to three fatty acid tails. These tails are comprised of a carboxyl group and a hydrocarbon chain. When the length of the hydrocarbon chains vary between 6 and 12 carbon atoms, the triglyceride is called a medium chain triglyceride (MCT, shown in Figure 2). And triglycerides with a longer chain length are called long chain triglycerides (LCTs). The carboxyl group can interact with water, but the hydrocarbon chain can’t. So the longer the hydrocarbon chain the more insoluble the triglyceride is in water. This is why most oils, which are comprised mainly of LCTs, form droplets in water instead of dissolving. Since our blood is mostly water, our body had to develop a way to break down LCTs and then shuttle their fatty acids to our tissues for energy or storage. 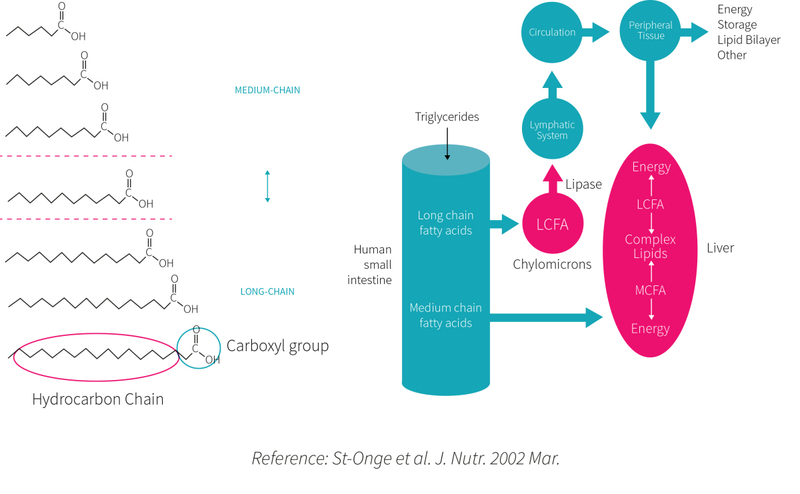 Once LCTs enter the small intestine, bile breaks them into smaller groups (thinks smaller oil droplets in water), allowing for lipase (an enzyme) to have more surface area access to break the triglycerides into fatty acids. The fatty acids then enter the intestinal wall. Still insoluble in blood, they must then be packaged into a chylomicron, which is basically a vehicle with an outer coating that can interact with water and an inner coat that interacts with the fatty acids. However, the chylomicron must first go through the lymph before it enters the blood circulation to take the fatty acids to any tissues in need. This roundabout process makes it so that LCTs are not readily available for energy, like glucose can be, soon after digestion. Conversely, since MCTs have hydrocarbons tails that are relatively smaller than that of LCTs, they can just barely dissolve in water. This allows the MCTs to enter directly into the portal vein, after which they can quickly be used for energy in the liver. How does CLA differ from the trans-fat produced in a lab? Industrially-made trans-fats (iTFAs, depicted in Figure 3) are harmful to health. They are synthesized in a lab by reacting a vegetable oil, which is made up of unsaturated fatty acids, with hydrogen in the presence of a catalyst such as powdered nickel. The reaction changes the double-bond in the unsaturated fat from a cis- to trans- conformation, causing the the “kink” in the fatty acid tail to straighten. The fewer “kinks” in a fatty acid, the more compact a group of them will be, making them more likely to be solid at room temperature. Therefore, trans fatty acids can be thought of as a hybrid between an unsaturated and saturated fat, as they have a double-bond like the former, but have no “kink” and are thus solid in room temperature like the latter. 9-CLA and 10-CLA, on the other hand, although considered trans fatty acids, differ structurally from most iTFAs. They contain both a trans- and cis- double-bond, causing them to maintain their “kink”. CLA also differs in that it is produced naturally in the digestive tract of ruminants, although it can also be synthesized in a lab. 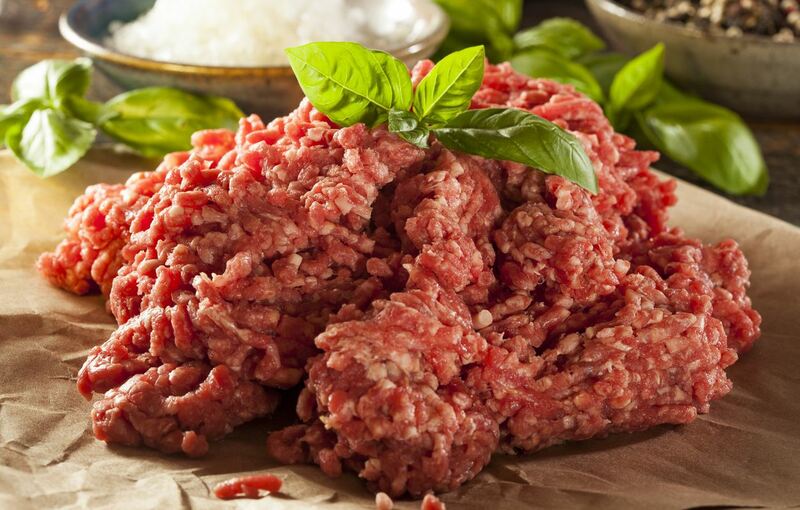 When produced naturally, linoleic acid is converted to CLA, which is then converted to vaccenic acid, the predominant trans fatty acid in ruminants. Interestingly, vaccenic acid can be converted back into CLA both in ruminant and in humans. As for the latter, base and heat can be added to a plant oil rich in linoleic acid to form CLA. The difference between the two methods of synthesis, other than one being made in a lab and the other naturally, is the ratio of isomers that are present. In animal products, 9-CLA is predominant (10-CLA is present, but in very small amounts), whereas in supplements the amount of 10-CLA is usually much greater, since chemists have a way of manipulating this. So what’s the big deal about the different ratios? Much of the research seems to suggest that while 10-CLA plays a much larger role in weight loss, it may also be deleterious to health, at least in doses found in supplements. In fact, it has been shown in humans to increase the low density lipoprotein to high density lipoprotein ratio (LDL:HDL), total cholesterol to HDL ratio, and triglycerides, whereas the 9-CLA variant does the opposite. 10-CLA has also been shown to increase oxidative stress and inflammatory markers in obese men, and fatty liver, hyperinsulinemia, and insulin resistance in animals. But as mentioned in ERD #14, Volume 2, naturally produced CLA, which is predominantly 9-CLA, seems to be relatively benign and shows a modest beneficial effect on triglycerides. However, that same study showed that vaccenic acid (the other, more abundant trans fatty acid that would be consumed when eating meat or drinking milk) seems to be just as detrimental for blood lipids as iTFAs. That being said, this study used a vaccenic acid dose that would require your diet to be 40-90% from ruminant fat, and observational and experimental evidence looking at whole-food sources of vaccenic acid (mainly milk fat) suggest that its harmful effects do not occur when obtained in this form. The study under review found that exchanging vegetable oil for either MCT or CLA during breakfast could substantially reduce food consumption for the rest the day. If maintained over time (which is not necessarily a safe assumption), this reduction in food intake would theoretically amount to approximately a pound of weight loss each week, making these results clinically relevant. In line with this finding, there are studies and plausible mechanisms for both MCT and CLA that support their ability to increase weight loss. However, there are also studies that show no difference in satiety, food intake, and weight loss when supplementing with MCT or CLA, although the research for MCT lies in favor of modest weight loss effect, whereas for CLA the research seems to be much more conflicting. Moreover, the isomer of CLA that is almost entirely found in supplements (only small quantities are present in animals) seems to be the one responsible for the potential weight loss effects, but also for the deleterious health effects.